Wellesley College Library subscribes to some 300 databases, most of which are governed by strict licensing agreements limiting access to Wellesley College students, faculty, and staff, with some provisions for walk-in users. For your convenience, here is a selection of scholarly electronic resources that are available free on the Web. In addition, see the "Key Websites" listed in each of our Research Guides by Subject pages for free resources by discipline. Your public library most likely provides access to a variety of electronic resources, including some of the same ones to which we subscribe. Scanned books from Wellesley's collections. Since 2008, Wellesley College has been contributing content to the Internet Archive project in collaboration with the Boston Library Consortium. To date, Wellesley has contributed over 2800 out-of-copyright books, music scores, College Archival materials, and other items to this project, whose mission is to provide free access to researchers, historians, scholars, and the general public. Scanned copies of the Wellesley News, hosted at the Internet Archive. Scanned copies of the Wellesley Legenda, hosted at the Internet Archive. Covers 1889-1950.
inks to over 135,000 digitized books and texts from almost 2,000 publishers. Two-thirds of of the titles are available free in full-text; other titles are fee-based. Requires free registration. Search the full text of thousands of books, many of which have been scanned from the holdings of major libraries in the United States. Displays only excerpts of each book; use the "Find this book in a Library" link to locate a nearby copy. More than 3,000 free books online (in .html format). Browse by topic. Oldest producer of free electronic books (eBooks or eTexts) on the Internet. 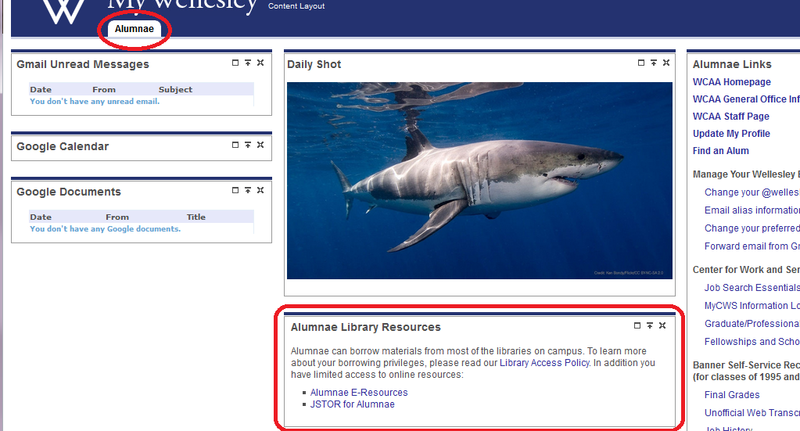 Alumnae can now access JSTOR journals through the MyWellesley portal. Get help logging in to MyWellesley as an alum. Search engine that identifies scholarly literature, including peer-reviewed papers, articles, and reports in all subject areas, linking to the full text, abstracts, and/or citations. Search engine to identify freely available, academically-oriented digital resources. Nearly 10,000 free, full-text, quality-controlled, scientific and scholarly journals. International gateway for patent information from North America, Europe, and selected other countries. Free journal articles from prestigious scientific journals; typical embargo period is 12 months; occasional exceptions. Indexes journal articles and publications related to education, published by the US Department of Education. U.S. government databases. Access to federal budgets, congressional bills and reports, the Congressional Record, the Federal Register, economic reports, the Public Papers of the Presidents, Supreme Court Decisions, the U.S. Code, etc. Indexes over 16 million citations for biomedical articles back to the 1950's. Includes biochemistry and related fields. Links to many sites providing free (and/or subscription-based) full-text articles. Gateway to authoritative selected science information provided by twelve U.S. government agencies.